For so long I personally have witnessed and battled with the kind of people this thought refers to. You know little of pain until you are caught in the war and chaos created by a divisive person. Divisive people like to create an ecosystem based around them and often their divisiveness is rooted in control of the ecosystem that feeds your destiny. Divisive people always seek to control the strings of vital relationships that feed your work, inspiration and those that give you validation. 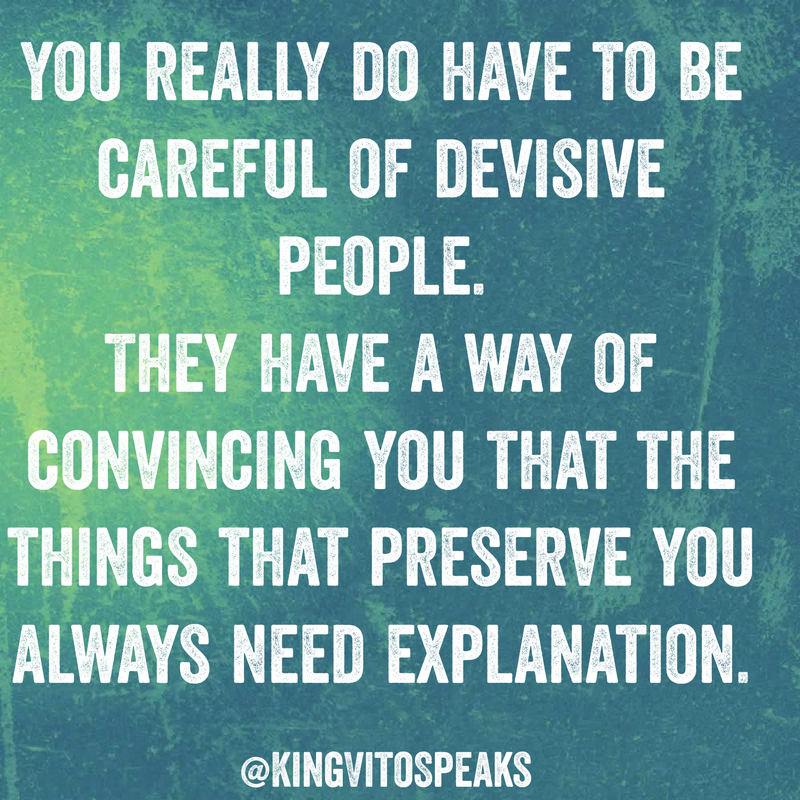 They spend the most time seeking an explanation for your preservation, Deliverance & transformation. They want the keys to everything that makes you unique as though they will unlock your next level of growth but really left up to them they would rather put you in the grave of unfulfilled potentials. Having been around them, having been in the midst of them I want you to know that the conversation is not about your well-being but about exposing you to humiliation. So mind yourself, be conscious that discussion about your plans, future, well-being is not supposed to be happening with people who by nature only see how they can dig holes rather than mount stepping stones. I’m sure in 2017 you have wised up even if its just a little bit. This entry was posted in Love, Men, Motivation, Relationships, Women and tagged Advice, Conversation, Friends, Life, Relationships, security, Thoughts, Truth, Women, Work. Bookmark the permalink.